Our previous post contains more detail, but in short, this story began gathering steam last year after French authorities began investigating the authenticity of a painting purportedly by German painter Lucas Cranach the Elder. That move caught the attention of Sotheby’s because, in 2011, Sotheby’s had sold for $10 million a work purportedly by Dutch portraitist Frans Hals, and the “Cranach” and “Hals” both had entered the art market relatively recently, through a chain of ownership that included a French collector named Ruffini. Concerned, Sotheby’s hired Orion Analytical, a specialty lab focusing on art forensics, to examine the Hals—and Orion concluded the work was a fake. Sotheby’s then rescinded the Hals sale and gave the buyer a refund. From there, the art market’s worries snowballed, because, as it turns out, Ruffini had also been the source of several other previously-unknown Old Master works that have been sold into the market in recent years. In the wake of the Hals revelations, several other works have now fallen under suspicion due to their connection with Ruffini. This week, Sotheby’s filed suit in New York federal court over a work titled Saint Jerome, which had at one time been attributed to the 16th century Italian painter known as Parmigianino (full name: Girolamo Francesco Maria Mazzola). The defendant in the case, Lionel de Saint Donat-Pourrieres, is a collector from Luxembourg who, according to the complaint, consigned the piece to Sotheby’s in 2011. The work was then included in a Sotheby’s auction in January 2012, where it sold for $842,500, of which the consignor received $672,000. 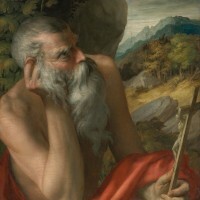 Based on what the complaint calls a “conclusive determination” that Saint Jerome is a modern forgery, Sotheby’s says that, just as it did with the fake Hals, it is rescinding its sale of the piece and “refunding in full” the money Sotheby’s received from the buyer in the 2012 auction. The auction house is now turning to the consignor to recover the money he received in that same sale. The complaint’s sole legal cause of action is a breach-of-contract claim, based on Sotheby’s standard consignment agreement, which specifically allows Sotheby’s to rescind a sale if Sotheby’s learns the work is “inaccurately described in the catalogue,” a “counterfeit,” or if Sotheby’s determines, in its sole judgment, that the sale might subject Sotheby’s to liability. Sotheby’s says it has informed the defendant of the rescission, but the defendant has refused to return any of the money. Sotheby’s further alleges that the consignor made and then breached some unspecified “representations” to Sotheby’s regarding the work. The suit seeks damages in the amount of the defendant’s proceeds from the sale, plus “related costs and expenses” and “additional monies lost because of Defendant’s breach.” Sotheby’s also seeks its legal fees, citing a contractual provision that requires a consignor to pay the auction house’s attorneys’ fees if the consignor breaches and Sotheby’s is forced to sue. The legal theory on which Sotheby’s proceeds is a simple breach-of-contract claim, so the litigation will likely focus on the contractual language at issue. (Interestingly, Sotheby’s has also indicated that it may ultimately take similar legal action against the seller of the Hals, London art dealer Marc Weiss; the auction house has already refunded the buyer of the Hals, but is apparently still negotiating with Weiss about returning his portion of the proceeds.) In other words, to prevail in this suit, Sotheby’s need not show that the consignor had any idea that the work was a fake; the defendant’s liability will hinge simply on whether the defendant breached a contractual obligation as defined by the operative agreements he signed. It’s worth noting, in this regard, that post-sale art litigation can often be simplified considerably when a sale is governed by a comprehensive contract that lays out the parties’ obligations, and what legal recourse is available should things go awry. But legal claims and relief aside, the filing of this case clarifies that now, two different works with links to Ruffini have been definitively labeled counterfeit following scientific testing commissioned by Sotheby’s. This is in addition to other Ruffini-connected works (including the purported Cranach, a purported Bruegel, and a purported Gentileschi) still under suspicion or investigation. As one commentator notes, the suspect works have some commonalities—they are “small-ish; of no certain provenance or publication history before the 1990s; on either panel or stone supports; by major but not first-rank artists”—but represent a variety of artists and styles, suggesting that if indeed there is a single forger behind them, he or she is quite versatile. For his part, Ruffini—who has not yet been charged with any actual misconduct—continues to maintain that he is only a collector, not an expert, and never presented any particular painting as authentic. Of the Parmigianino, Ruffini’s lawyer told the New York Times that the work had indeed passed through Ruffini’s hands, but questioned Orion’s conclusion, citing experts who believed it to be genuine. Interestingly, Orion Analytical, the lab that investigated the “Hals” and “Parmigianino” fakes on behalf of Sotheby’s, has since become part of Sotheby’s; in December, Sotheby’s announced that it had acquired Orion and appointed Orion’s founder, James Martin (a key expert witness in last year’s Knoedler trial), as head of the auction house’s newly formed scientific-research department. One commentator mused that the presence of such scientific expertise in-house might give Sotheby’s a “slight edge in terms of confidence in the Old Masters market.” (And, relatedly, it’s worth noting that the rest of the market going forward may need to look elsewhere for this highly specialized type of expertise, as Orion’s services will apparently no longer be generally available except through Sotheby’s.) Overall, Sotheby’s work with and ultimate acquisition of Orion is consistent with the art market’s increasing tendency to turn to scientific analysis in detecting fakes, as we have seen in the Knoedler forgery scandal, and now as this Old Master controversy unfolds. We’ll continue to follow this and other developments related to the ongoing issues in the Old Master market.